Today, the Metropolitan Museum of Art opens its largest fashion exhibition ever. "China: Through the Looking Glass," a collaboration between the museum's Costume Institute and Department of Asian Art, which celebrates its centennial this year, explores the ways in which Chinese aesthetics have influenced Western fashion, from the dawn of the silk trade in the late first century to today. It spans three floors and includes more than 140 articles of clothing shown alongside Chinese costumes, paintings, porcelains, film and other objects. "This isn't just the biggest Costume Institute show we've done," said Met Director Thomas P. Campbell at Monday's preview. "It's probably one of the biggest exhibitions we've ever undertaken." The exhibition starts in the museum's basement galleries, with mirrored funhouse rooms projecting film clips selected by Hong Kong director Wong Kar Wai. Here, haute couture pieces -- such as a super slinky sequined red column with a thigh-high slit and circular motifs designed by Tom Ford for YSL -- stand alongside matching 18th-century Chinese Imperial robes. An adjacent gallery shows the evolution of the qipao, the high-necked shift that would epitomize Shanghai glamour from the 1920s on, and its (often more scandalous) Western derivatives by Jean Paul Gaultier and Marc Jacobs. The disorienting effect is intentional, said curator Andrew Bolton, citing Alice's Wonderland. "The show is not about China per se, but a virtual fantasy of China." Fantasy is right. 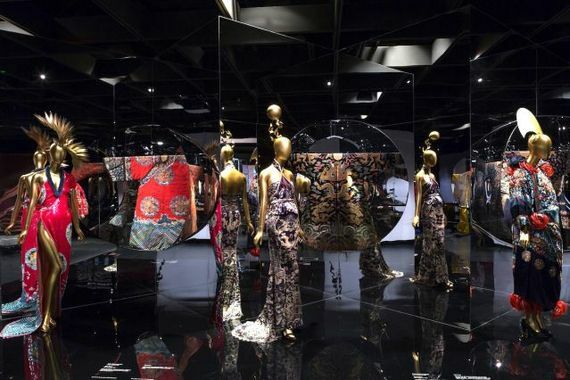 The exhibition winds its way through the museum's Asian art galleries, revealing exquisite tableau: a gold Guo Pei gown surrounded by Buddha statues; John Galliano's Beijing-opera-inspired silk robes floating over a garden lake; Gaultier-clad mannequins duking it out in a "House of Flying Daggers" bamboo forest. But even if many of the designs here take only the most superficial aspects of Chinese culture and art, the exhibition is more than just dazzling set-ups and gorgeous couture. Indeed, it raises many thought-provoking questions about the ways designers and artists take, interpret and appropriate from other cultures. Take calligraphy, which because of its "exoticism," is often seen by Western designers as purely decorative. For one 1950s Dior dress, for example, is adorned with painterly characters from an 8th century text. Unfortunately, the text consists of a letter complaining about a painful stomach ache. And that's one of the more innocent snafus in the exhibition. Yet, "China: Behind the Looking Glass" provides a nuanced take on the practice of borrowing, or stealing, from other cultures, showing its painful consequences as well as its wonderful creations. As the filmmaker, and exhibition artistic director, Wong Kar Wai stated at the preview: "It's a celebration of fashion, cinema and creative liberties."